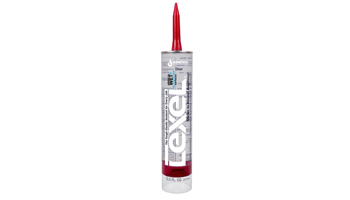 Lexel® is the “duct tape” of all caulks. Super-elastic. Superior adhesion. Paintable. It seals around anything: tubs and shower stalls, sinks and counter tops, window frames and door frames, PVC and metal pipes. Apply to wet or dry surfaces, indoors and outdoors. It’s tough and can handle up to 400% joint movement. It’s scrubbable. It sticks to just about anything. 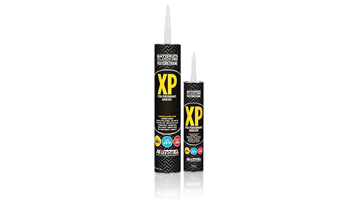 Gator Block Bond Xtra Performance Low VOC Adhesive is one of the strongest polyurethane adhesives on the market. 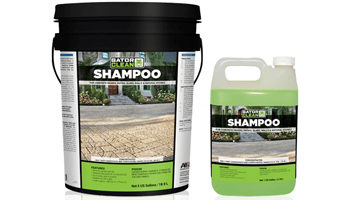 It is especially formulated for bonding concrete, natural stones, blocks, bricks, and pavers. Can be used on dry or humid surfaces and is intended to provide a permanent bond to approved materials. Gator Mulch Bond is a liquid binder that is sprayed on mulch to keep it in place. This will greatly reduce maintenance and clean up. 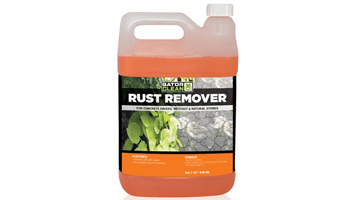 Will Remove any efflorescence stains trapped in the concrete pavers and natural stone pores. It will make pavers look more clean and vibrant without discoloring or damaging the paver surface. This efflorescence cleaning is a highly suggested step before a sealer is applied. The sealer will be able to get a deeper penetration into the now-clean pores. 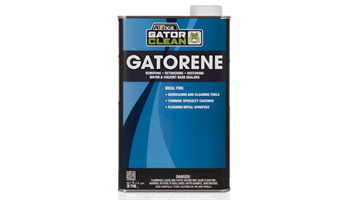 Gatorene is ideal for removing, retouching & restoring water & solvent-based sealers. Gatorene will also remove certain adhesives, and is an excellent clean-up solvent for tools and equipment immediately after use. It is also great for clean up and flushing of sealers, metal sprayers. Efflorescence is salt inside the paver brick or natural stone that comes out on the surface forming a whitish film. 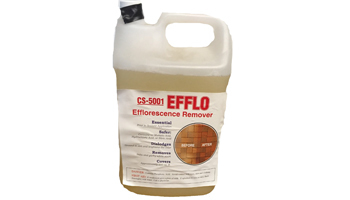 CS-Efflorescence Remover contains phosphoric acid. 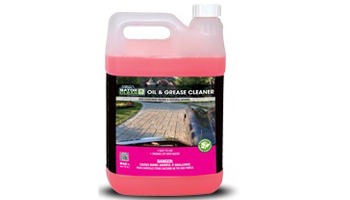 Gator Oil and Grease Cleaner is effective in removing oil & grease from the surface of concrete pavers and natural stones. Just apply the product to the stain and let it soak for 2-3 minutes. Scrub the area with a hard bristle brush and rinse with water. Repeat the steps if necessary. 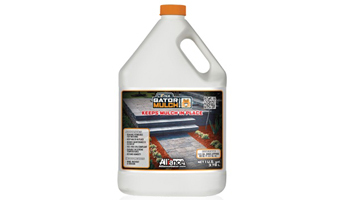 Gator M3- Cleaner Moss, Mold & Mildew helps remove unsightly moss, mold, and mildew. It is an environmentally responsible alternative to harsh chlorine-bleach, heavy metal copper, and phosphate based products. 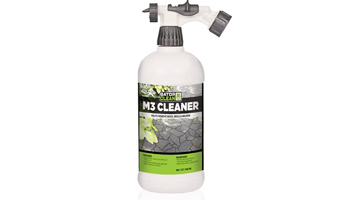 Gator M3-Cleaner will not harm plants, shrubs, or trees, its activated peroxide chemistry poses a reduced risk to people, pets, and the environment. 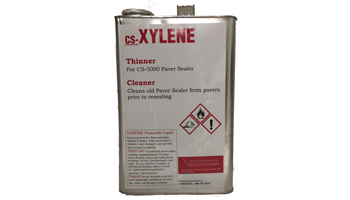 Xylene removes old paver sealer from pavers prior to new sealer application. 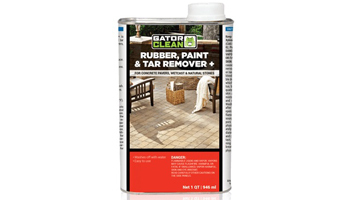 Gator Seal Satin Look Sealer is made from acrylic-based polymers. 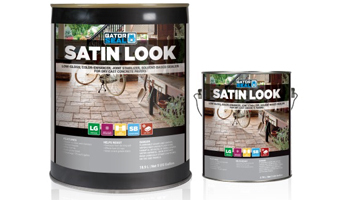 Gator seal Satin Look Sealer penetrates deep into the concrete pavers, thus reducing the oil and dirt penetration, as well as protecting them from the corrosion of de-icing salt. Specifically formulated to be used on unsealed surfaces only. Gator Satin Look is considered a Low Gloss Acrylic Finish. Gator Seal Wet Look Sealer is made from acrylic-based polymers. 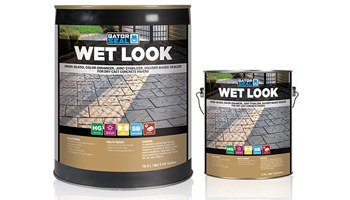 Gator Seal Wet Look Sealer penetrates deep into the concrete pavers, thus reducing the oil and dirt penetration, as well as protecting them from the corrosion of de-icing salt. Specifically formulated to be used on unsealed surfaces only. Gator Wet Look is considered a High Gloss Acrylic Finish. A transparent, water repellant, clear acrylic coating specifically formulated for use on concrete and brick. It retards spalling, cracking, crazing, efflorescence, and yellowing from direct sunlight. 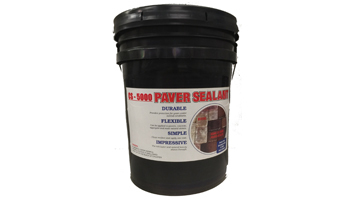 CS-5000 Paver Sealer is classified as a High Gloss Acrylic Paver Sealant. 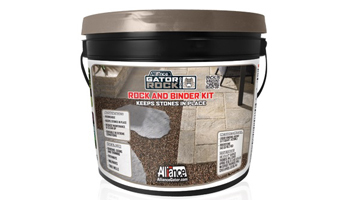 Gator Seal Resealer for concrete pavers is made from acrylic based polymers. 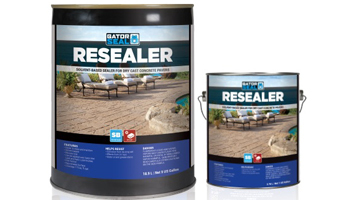 Gator Seal Resealer will penetrate the formula of the existing sealer and reactivate the molecule to create a rejuvenated seal to protect the paver surface. Thus reducing the penetration of oil and dirt, as well as protecting them from de-icing salt. 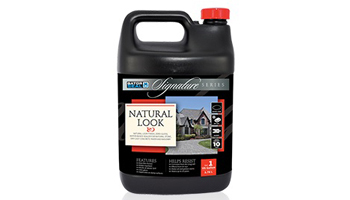 Gator Seal Natural Look is made from fluorochemical polymers. This water-base sealer penetrates deep into the concrete pavers, walls, masonry and natural stones, thus reducing the oil and dirt penetration, as well as protecting them from the corrosion of de-icing salt. 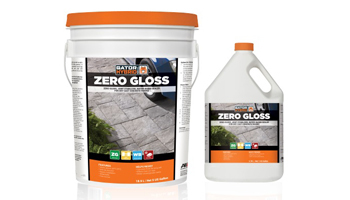 Gator Hybrid Zero Gloss Seal is a Water Base Sealer used to seal concrete pavers. It penetrates deep into the concrete paver pores, thus reducing the oil and dirt penetration, as well as protecting them from the corrosion of de-icing salt. 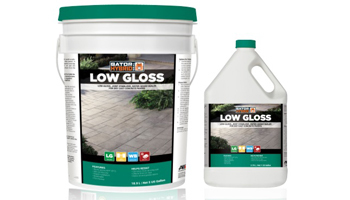 Gator Hybrid Low Gloss Seal is a Water Base Sealer used to seal concrete pavers. It penetrates deep into the concrete paver pores, thus reducing the oil and dirt penetration, as well as protecting them from the corrosion of de-icing salt. 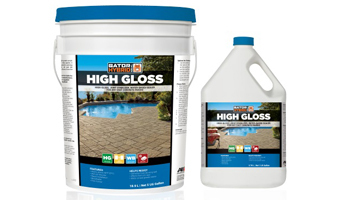 Gator Hybrid High Gloss Seal is a Water Base Sealer used to seal concrete pavers. It penetrates deep into the concrete paver pores, thus reducing the oil and dirt penetration, as well as protecting them from the corrosion of de-icing salt.